This week, Britt catches up with Angela Manuel-Davis — an incredibly inspiring woman — motivational coach, fitness evangelist, speaker, co-founder of @Urbanfitness911, founder of @AmdioMethod, @SoulCycle Master Instructor, @Nike athlete and @Corkcicle Ambassador. As a member of the USA Track and Field Team, Angela was a five-time All-American who held world-ranked times at the 100m. 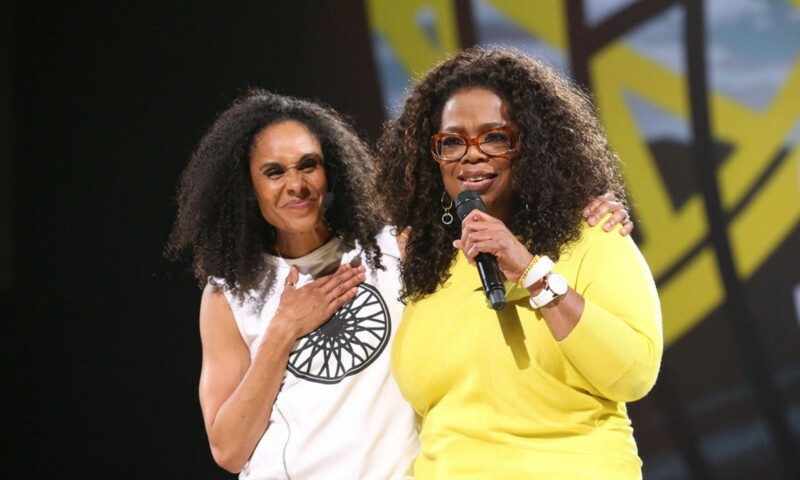 She ran track professionally for Nike, was an Olympic Trials semi-finalist, and a member of the World Championship team… and did we mention, Oprah loves her?! In this interview, Britt ask Angela about her purpose, passion and what’s next for her. Thank YOU for helping me stay in my GLOW. ANGELA MANUEL-DAVIS: A fitness instructor extraordinaire inspiring change from the inside out. Her vessel? A 45 minute spin class in a dark room on bikes going nowhere…but yet everywhere. OK, So whooooo is she? Well, on the surface she is an incredible human earth-angel radiating greatness. I’m serious. For many, she really doesn’t need an introduction. I am blessed to not only call her my mentor but my friend. SHE is the reason for HUSTLE IN PURPOSE. So again, Thank you AMD. I could give you her CV (which is impressive) and there is no doubt you would be wowed and floored and be like, “OMG she’s so cool.” I mean, yes, she is cool. ANGELA is the epitome of cool. That sneaker game is 💯. That Fear Of God Clothing 💯 on point. She walks with confidence. Not in an egotistical way but a COOL way. But real talk, want to know what makes @shapewithangela so special? She has single-handily turned a 45 minute spin class into a spiritual sauna and trains everyone in her room as athletes. They challenge us and, in turn, bring out the best in us. They make us laugh and cry and question everything. But in the best way possible. They make us present in the moment. She has created a community. For me personally, she has taught me my dream is valid. She has taught me how to live compassionately. She has taught me how to take my power back and get rid of anything robbing me of that. She has reminded me thatI’m destined for greatness. So, finally, one year after I had the initial idea for HUSTLE IN PURPOSE (in her class) I had the most full circle, pat myself on the back moment when I got to visit her in her home on April 12th to have a conversation over a smoothie. Purpose — let’s talk about it. So many people are in search of it, wouldn’t you agree? As I previously mentioned, her class is a spiritual sauna with the by-product being a cardiovascular workout. Why is it necessary to have ALL OF THAT GOODNESS poured into us in that vulnerable state? Does living in purpose mean life is easy? With that being said, is crisis necessary for change? I know you have a lot of projects up your sleeve. What or where can we expect to see you? 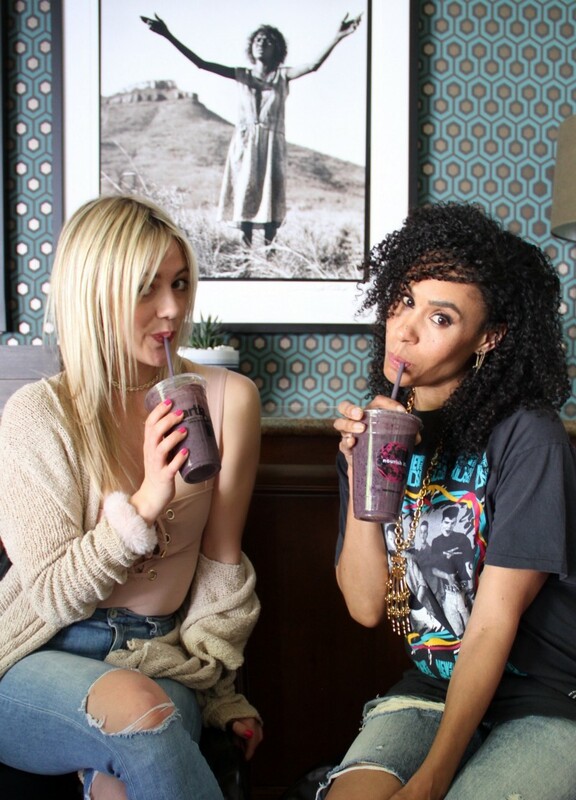 Follow Angela here and Britt Loves Smoothies here.